I began with a discussion of closed guard grips. A basic but very useful grip is to get a really deep grasp of the collar: you may find it helps to sit up to get that in really deep. As Roy Dean discusses in Brown Belt Requirements, an especially deep grip can help your choke as well as give you authoritative control. Once you have it, that provides three main advantages. Firstly, this gives you great control, as you can pull them down towards you. Second, it could be the beginning of a choke, and perhaps more importantly, it will make them start to worry about that choke rather than thinking about passing. Teaching Notes: I'm still not completely certain about this class, as I don't feel the structure is quite there yet. I remember most of what I wanted to teach, although I didn't go into detail on the Akins hip shift sweep, which might have been useful. Interestingly, I had an immediate opportunity to use the combat base counter Josh showed me last weekend in Florida, as Chris was asking about what to do against combat base. The answer (or rather, one possible answer) is to simply shrimp out a bit, hook their ankle with your outside foot, then pull it outwards while also using your collar grip to pull them down. That can help you move right into a submission. I'd like to do more work on the deep collar grip, as I'm keen to get better at sequences from there (e.g., choke attempt, then collar drag, reversing into a sort of collar-based sit-up sweep if they resist, along with the loop choke option when it presents itself). The downside is that requires a gi, which is fine for me, but not everyone in the club has a gi yet. 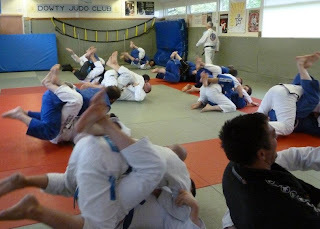 Fortunately the Bristol Sports Centre location tends to be pretty good on having people attend wearing a gi, so if I do teach it, best for me to do it there. I also upped the number of BJJ specific drills in the warm-up. I may have gone on too long with that, but I'll review as time goes by. Totally doesn't require a Gi to do that combat base hook, btw. The rest of the sequence with all of the collar shenanigans does, but the shin pop you just need triceps control on the combat base side so that your opponent can't immediately base, or head control on the non-combat base side.